Women with a personal or family history of breast or ovarian cancer are increasingly presenting for genetic cancer risk assessment (GCRA). To explore the personal and family impact of GCRA, four focus groups were conducted of women seen for risk assessment. Participants were 22 primarily non-Latina White women with a personal or family history of breast or ovarian cancer. Analysis of the data identified new themes related to balancing time to assimilate risk information with the need to make timely healthcare decisions, physicians’ lack of sufficient genetic knowledge, and concern for daughters regardless of the daughters’ age. Other themes related to protecting others, knowledge as empowerment, reassessing personal attribution of cancer risk, managing uncertainty, reappraising body image, and experiencing divergent family responses to communication of cancer risk and healthcare decisions. 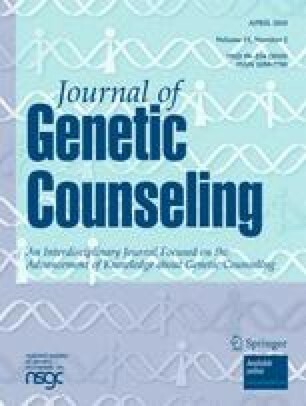 Understanding the personal and family impact of GCRA may enable genetics professionals to tailor their counseling efforts to better meet the needs of these women. Additional research is needed to extend these findings and identify interventions to support positive outcomes of GCRA. This research was supported by funds from the California Breast Cancer Research Program of the University of California, Grant Number 5BP-0051 (D. MacDonald, PI) and in part by funds received under Grant Agreement No. 99-86874 with the California Department of Health Services, Cancer Research Section (J. Weitzel, PI). The authors thank Janelle Hilario and Shawntel Payton for editorial assistance. the National Society of Genetic Counselors.